Working feverishly on the bench, I’ve had little time to closely track the ongoing spat between Dawkins and Nisbet. Others have dissected this conflict and its ramifications in great detail. What I want to discuss is whether scientists can or should represent their fields to non-scientists. There is more than a dollop of truth in the Hollywood cliché of the tongue-tied scientist. Nevertheless, scientists can explain at least their own domain of expertise just fine, even become major popular voices (Sagan, Hawking, Gould — and, yes, Dawkins; all white Anglo men, granted, but at least it means they have fewer gatekeepers questioning their legitimacy). Most scientists don’t speak up because they’re clocking infernally long hours doing first-hand science and/or training successors, rather than trying to become middle(wo)men for their disciplines. Experimental biologists, in particular, are faced with unique challenges: not only are they hobbled by ever-decreasing funds for basic research while expected to still deliver like before. They are also beset by anti-evolutionists, the last niche that science deniers can occupy without being classed with geocentrists, flat-earthers and exorcists. Additionally, they are faced with the complexity (both intrinsic and social) of the phenomenon they’re trying to understand, whose subtleties preclude catchy soundbites and get-famous-quick schemes. Last but not least, biologists have to contend with self-anointed experts, from physicists to science fiction writers to software engineers to MBAs, who believe they know more about the field than its practitioners. As a result, they have largely left the public face of their science to others, in part because its benefits — the quadrupling of the human lifespan from antibiotics and vaccines, to give just one example — are so obvious as to make advertisement seem embarrassing overkill. As a working biologist, who must constantly “prove” the value of my work to credentialed peers as well as laypeople in order to keep doing basic research on dementia, I’m sick of accommodationists and appeasers. Gould, despite his erudition and eloquence, did a huge amount of damage when he proposed his non-overlapping magisteria. I’m tired of self-anointed flatulists — pardon me, futurists — who waft forth on biological topics they know little about, claiming that smatterings gleaned largely from the Internet make them understand the big picture (much sexier than those plodding, narrow-minded, boring experts!). I’m sick and tired of being told that I should leave the defense and promulgation of scientific values to “communications experts” who use the platform for their own aggrandizement. Nor are non-scientists served well by condescending pseudo-interpretations that treat them like ignorant, stupid children. People need to view the issues in all their complexity, because complex problems require nuanced solutions, long-term effort and incorporation of new knowlege. Considering that the outcomes of such discussions have concrete repercussions on the long-term viability prospects of our species and our planet, I staunchly believe that accommodationism and silence on the part of scientists is little short of immoral. Unlike astronomy and physics, biology has been reluctant to present simplified versions of itself. Although ours is a relatively young science whose predictions are less derived from general principles, our direct and indirect impact exceeds that of all others. Therefore, we must have articulate spokespeople, rather than delegate discussion of our work to journalists or politicians, even if they’re well-intentioned and well-informed. 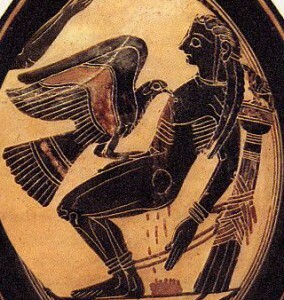 Image: Prometheus, black-figure Spartan vase ~500 BCE. Note: An earlier but more detailed exploration of this issue appears in my award-winning essay The Double Helix: Why Science Needs Science Fiction. Update: As a prime example of the attitudes described in this article, view the speaker lineup of this year’s Singularity Summit. You are currently browsing the Astrogator's Logs weblog archives for April, 2009.